This is a top rear view of the front panel. On the left the digital signal connector and to the right the pulse input level adjust variable resistors and input BNC connectors. Next is the phone plug jacks for the input analog signals and the blue ten turn input gain adjust variable resistors. On the right is the controls to set the frequency of the clock. 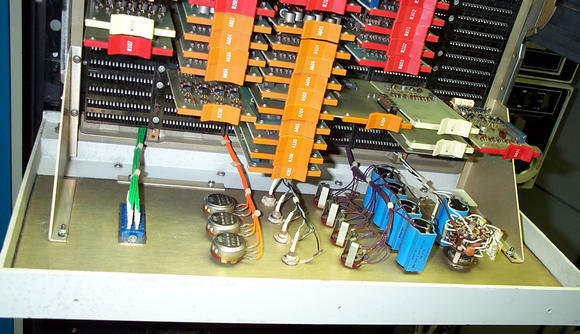 The rotary switch selects a timing range with by selecting different value capacitors. You can see they get physically bigger as their value increases. Below it is another 10 turn variable resistor for the fine frequency selection. The clock is used for program timing and can be the analog to digital sample clock.